At Ashley Douglas, we like to ensure that you understand the terminology or ‘lingo’ when it comes to choosing diamonds for custom jewellery. Diamond wedding rings and diamond engagement rings are significant pieces of jewellery, so it is important that only the best diamonds are selected for your rings. We design and craft diamond wedding rings for ladies, diamond wedding rings for men, and diamond engagement rings. 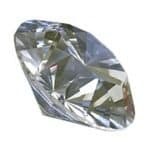 To help you select the best diamonds for your custom jewellery, we have included some information about diamonds below, however, if you want to know more about diamonds, please do not hesitate to contact us. Our workshop is located in the Brisbane Arcade and we design custom rings and dress jewellery for all styles and budgets. When purchasing a diamond for an engagement or wedding ring, it is important that you’re familiar with the “4 C’s”. 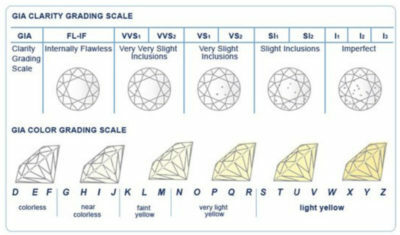 These four factors determine the grade and, accordingly, the price of a diamond. More than any other criteria, cut determines the fire and brilliance of your diamond. Cut refers to the angles and proportions of a diamond. A well-cut diamond will internally reflect light from one mirror-like facet to another and disperse and reflect it through the top of the stone. To maximise a stone’s fire and brilliance, a diamond’s facets and angles must be perfectly aligned and boast a superior polish and surface luster. Colour is a critical factor for diamond wedding rings and diamond engagement rings. Colourless diamonds are relatively rare and a truly colourless diamond will fetch a premium price. Most diamonds have traces of yellow or brown due to the presence of nitrogen. Clarity refers to imperfections in a diamond, called inclusions. Inclusions are naturally occurring identifying characteristics and can look like tiny clouds, bubbles, feathers or black spots. Inclusions block light and detract from a stone’s beauty. A diamond free of inclusions is very rare and therefore very valuable. The type and number of flaws in a diamond will determine the grade of clarity and the value. FLAWLESS (FL) No internal inclusions or surface blemishes visible under magnification. INTERNALLY FLAWLESS (IF) No interior imperfections but minor surface blemishes are visible under magnification. VVS1-VVS2 Very, very slight (or small) inclusions, that are difficult to detect under 10 power magnification. VVS1-VS2 Very slight (or small) inclusions, which are still difficult to see under 10 power magnification. SI1-SI2 Slight inclusions – minor imperfections visible under magnification, although not easily detectable to the untrained eye. Carat is a gemologist’s standard that measures a diamond’s weight and an important factor to take into consideration when looking for the perfect diamond for an engagement or wedding ring. One carat is divided into 100 “points”, so that a diamond of 50 points (pt) weighs 0.50ct. A carat weighs approximately one-fifth of a gram, about the weight of a small paper clip. Larger diamonds are found less frequently, which in turn makes them more valuable. However, carat weight alone does not determine value. Two diamonds of equal carat weight can differ greatly in price due to cut, colour and clarity. Size alone is meaningless. The team at Ashley Douglas are more than happy to meet with you and answer all of your questions regarding the use of diamonds in custom engagement rings, wedding rings and items of bespoke jewellery, diamond prices and availability. Contact us today by phone on (07) 3012 8112, email or visit our workshop in Brisbane Arcade on the Queen Street Mall.